It’s the perfect time of year to make marmalade, with citrus falling on the ground and the ginger leafless in the greenhouse. Lime and Ginger Marmalade uses both, and is delicious. It was easy to make, although it happened over 2 days. My Iris unguicularis is doing so brilliantly! I’m very excited about it – the nurseryman who sold me the baby plant said he grows his under a big Totara tree facing the sun. Mine is at the base of a tree at the edge of a path and it has spread to about 18″ wide after 3 years, and has been flowering since late Autumn. I’ve combined them in the vase with some native cultivars : leaves of the Cordyline ‘Magenta Rays’, and a pink flowered Tea Tree (Leptospermum). These olives are almost the last of a big batch which have been sitting under the table for the last year in jars in a box with a towel over it. The brine has to be changed every so often and if they were hidden away in a closet it would never get done. It was rainy for part of the day yesterday, so a good day for making jelly. The day before was fine, so a good day for making cider. Cider making is so messy and there are lots of buckets and the chopper and the press to be hosed off afterwards so it’s nice to do that outdoors in the sun over some dry part of the garden. Easter is a great time to do this as it really took the best part of 2 days. In a pinch you could freeze the pomace and do it later though. Half of the apples we used were frozen apples from last year. These were very ripe when they were frozen. We kept ‘sweating’ them last year while we waited to have time to make the cider. Finally they started going off so we just put them in plastic bags in the freezer. These provided the ‘Sweet’ and most of the raw ones from this year were Grannies and not terribly ripe so that provided the sour. We even put in a few of our crab apples. The frozen apples made lots of sweet juice – they released the juice much more easily for the cider. I would do this again, even if it’s just putting early sweet apples in the freezer for a month or so. 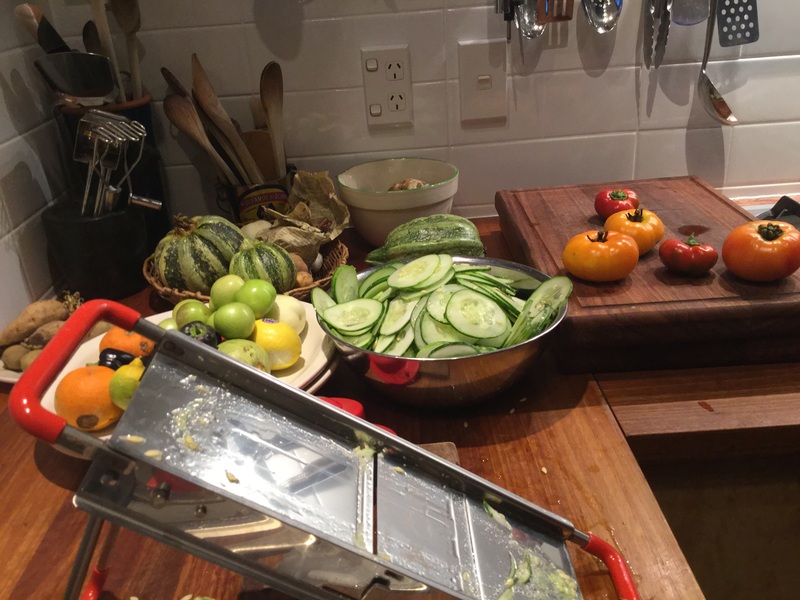 It’s the sort of thing where most of the time is in the clean up and set up, so you could easily make double or triple the amount. Next time it would be better to cut the apples up before freezing, as they take a lot of freezer space whole. They also tend to clog the chopper so it would be better to mix the raw and frozen from the start. Using frozen apples meant there was less juice left in the pulp for jelly, which meant a lot of water needed to be added. It still set properly, so the pectin was still there, and it absorbed the mint and Chili flavour well and tasted good. I think it would be fine for pectin too. For the plain apple jelly I used the raw pomace. I couldn’t use all of it so the worms had a good feed as well. We tried 2 mint jelly recipes – one where you cook the apple with mint and vinegar, the other you just make normal jelly and then drag a bunch of mint in the jelly and add a few drops of green colouring before bottling. Both have chopped mint in the jar. Dragging the mint in the jelly gives a surprising strong fresh mint flavour so we did that for both. We will do a side by side test tonight with lamb roast. 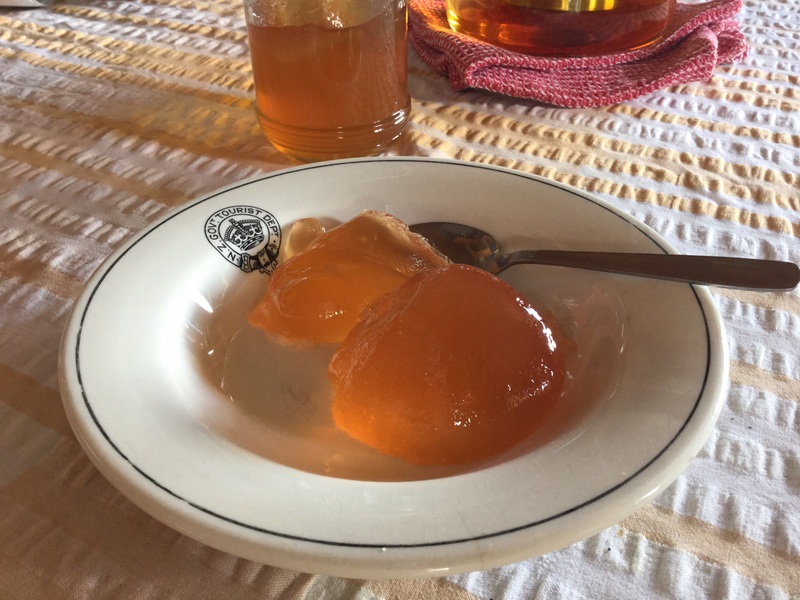 The sage jelly and chili jelly both have a bit of vinegar in them as well. We tried the chile jelly on crackers last night. Quite hot and nice with cream cheese. 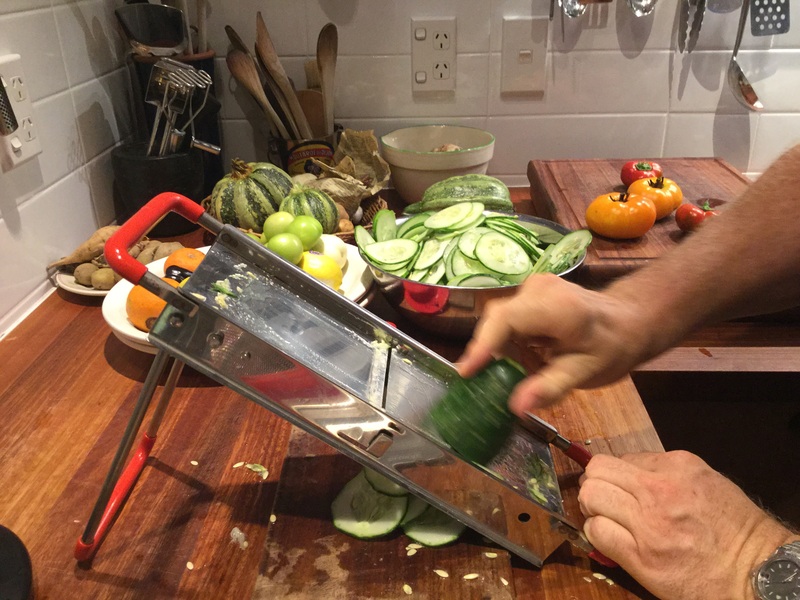 I used about 12 diced red little hats and 1 green jalapeño all with seeds – initially for one batch, but I added more juice and sugar as it seemed very hot. I suspect it will get milder as time goes past. I found that a kilo of sugar is about 4 cups, so that’s a lot of jelly, about 30 medium jars. The apple jelly smells like fresh apple juice and is nice on toast. The 14 litres of cider is bubbling away nicely. This will go back to the city to bubble in the dark cupboard under the stairs for the next few months. We also had an extra 3 litres of juice for drinking as we didn’t have another Demi john. This was from about 4 big baskets or bins full of apples – 2 from last year and 2 from this year. We celebrated by drinking some of the 2 year old cider which was delicious. It’s lighter than wine in alcohol and has a dry sparkling taste. Nothing like the sweet cider you buy. I could drink a lot more of it if we had more apples. We watched the eclipse, it was clear for long enough to see it disappear slowly over about half an hour. 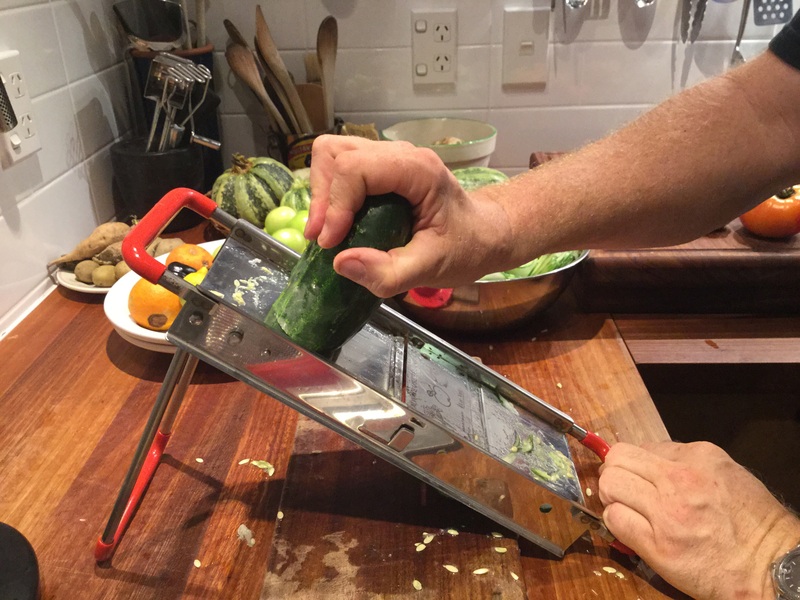 I made bread and butter pickles with my gherkins which grew too big and Apple Cukes mixed. They are yummy with strong cheddar cheese and sourdough bread. There are still a few more this week so I might make a few more. 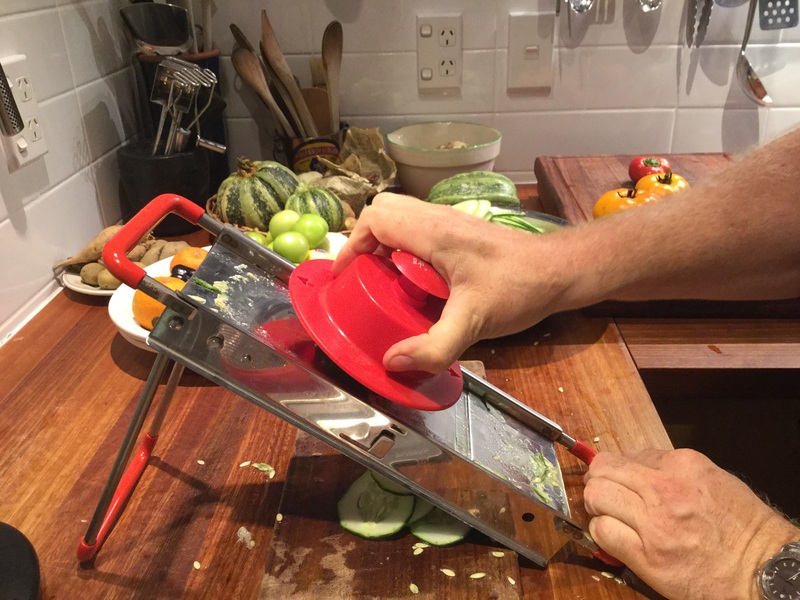 Having avoided the mandolin for years after seeing Rick Stein cut himself with one on TV, we used it and it saved so much time and did such a good job – and no injuries!